I've been a fan of Sonic Drive-In since 1976, when I first tasted a Frito Chili Pie. My absolute favorite thing on the menu is a drink. 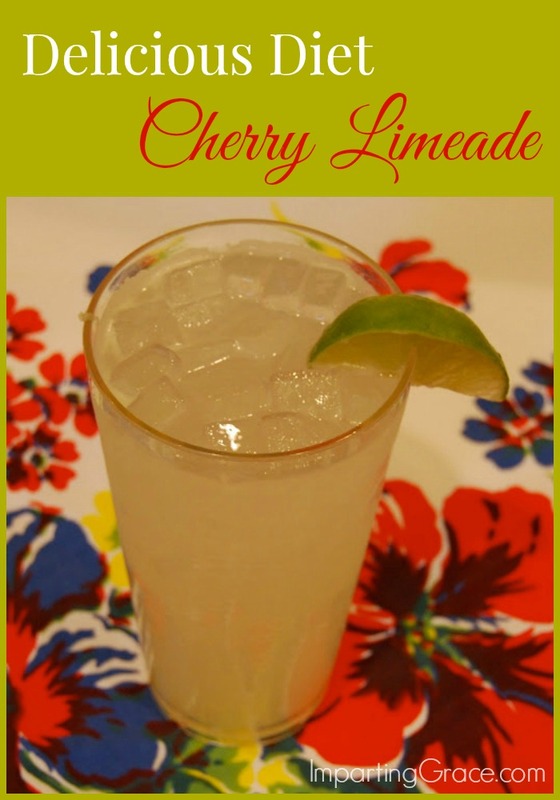 I love Sonic Limeade--both the regular and the cherry varieties. And since I'm often counting calories, I especially love the Diet Limeade. Alas--there's no Sonic in my town. I always visit a Sonic when I come across one on a roadtrip, but that's not often enough to fulfill my desire for Limeades. So I've come up with a way to make my own DIY version--and it's awfully good! Here's all you need for a Diet Limeade, Sonic-style. You can find this key lime-flavored sparkling lime beverage at Wal-Mart. It costs 68 cents for a 1-litre bottle at my local store. (Note: This beverage contains aspartame, just like Diet Coke. I know that some of you avoid artificial sweeteners; sorry I don't have a recipe for you.) I don't like this key lime water on its own, but in this limeade, it's the magic ingredient. 1. Squeeze the juice of one lime into a large glass (or, if you live with lots of boys and dogs as I do, into an acrylic cup). 2. Add a bit of sweetener if you like. I like to add a packet of Stevia to mine. 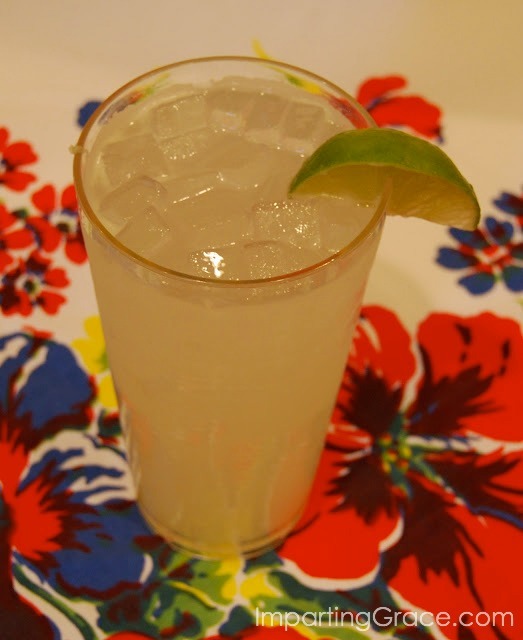 If you prefer a very tart limeade, you can skip this step. 3. Pour in about 12 ounces of the key lime-flavored sparkling water. Stir well. 4. Fill glass with ice; garnish with lime and enjoy! Add maraschino cherries and a little of their syrup if you want a cherry limeade, but be aware that wouldn't strictly be a "diet" drink. My mouth is watering for a cold limeade now! What's your favorite thing to drink in the hot weather? I adore a Limeade from Sonic. Thanks so much for sharing this. I'm definitely going to try it and I'm pinning it to spread the word. Oh, I love these limeades too! Thanks for the recipe. We do have a Sonic here and it overlooks the Gulf of Mexico. It's quite a busy place. I also love their extra thick chocolate milkshakes. I just made myself a Cherry Limeade (not diet). It's half lime sparkling water and half Minute Maid Cherry Limeade. It just needed some fizz. We really need a Sonic in this town! This looks delicious! Can't wait to try it out! Thank you for the tutorial. We don't have Sonic in Indiana either, but I enjoy a trip whenever I'm down south. Oh! This looks so delicious! I wish I had one right now! That sounds so delicious Richella! I'm definitely going to be making these at our house this summer! I love Sonic, too! Have you ever had their tator tots with cheese? I know it has alot of calories, I'm sure, but sometimes I have to have a small order with a cherry limeade. I'll have to try this recipe. YUM! That sounds so good. 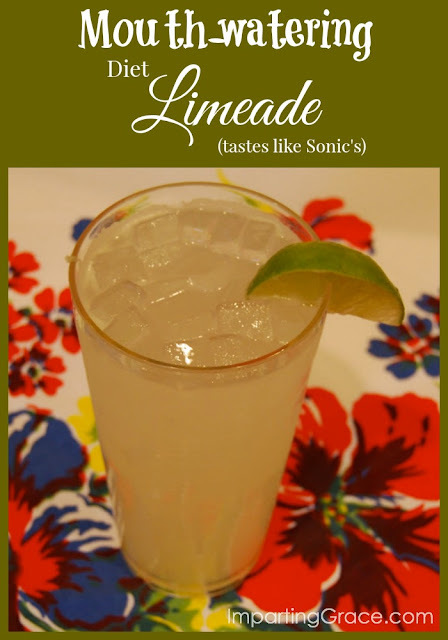 I've only been to Sonic once and didn't have the Limeade, but this I'll have to try. The children will love it. We do like the Key Lime on its own and call it "special drink" so that everyone realizes it's a treat. If you can get it in the 2 liter bottle, it's cheaper. Favorite thing to drink on a hot summer day? Water! thanks . I LOVE Sonic's limeade. I have a really hard time staying away from sonic on a summer day. I've never tried one of those. Sounds like a nice drink on a hot summer day. We used to have a Sonic in my town, but they moved. I always liked their ice-cream style desserts! YES! i did an all natural one last summer and we virtually lived on it - the natural sparkling water is a bit more expensive, but still cheaper than fixing the craving at sonic on a regular basis! I can't have aspartame, but I think I'll try stevia, lime seltzer and the lime juice. We've just recently had Sonic open up here in CT and I've not been to one. Closest one is about 15 mi. away and I just don't get out there much so I haven't tried the real thing. Yummers - this sounds really good! My mouth was watering just reading about it! This looks amazing. I recently gave up caffeine and have been looking for a substitute. Perfect! This is EXACTLY what my tummy is needing!! It looks utterly delicious - and completely refreshing....and I need some RIGHT NOW!! I will have to try this. I drink way too much sweetened ice tea, so maybe I can switch to this instead! Thank you for this recipe. The last time I got my diet limeade @ the Sonic it was so sweet it was undrinkable. I like them very tart. I am lucky in that we have 3 Sonics within five miles of each other. Also, my son works as a line cook at a Sonic so he tells me all the Sonic Secrets! This recipe is yummy and similar in taste to Sonics. I also find that whoever is on drinks at Sonic determines the yumminess level. Cheers!